For more than half of my life I have identified myself as a composer, but I have come to feel that traditional composition is too narrow, too confining: true creativity knows no boundaries. This blog is my scream into the darkness: anything that strikes me as being noteworthy, that sparks my interest or angers me enough to inspire something to be written shall be fodder for this page. Please, enjoy the insanity. This story was originally posted before, re-edited, and posted it again ... well, it’s Christmas again, and I’ve revisited the story and am reposting it here, and on my companion blog, as my Christmas gift to you all - as my thanks for reading throughout the year. There are some differences to the story, so if you’ve read it before you might want to give it another glance to see if you can catch the differences (or to see if I’m just pulling your leg ... [I’m not ... I assure you ... there have been changes]). The words echoed in his mind as the final child approached him. “Baring any changes ...” oh, but there had been changes, hadn’t there? The column of armoured vehicles had left their forward operating base at 0500h and entered a mountain pass, to rendez-vous with a group of Afghani tribal representatives, but it had all been too easy. As they left the meeting site they came upon a bottleneck in the road and encountered an ambush: several insurgents with armed with both heavy machine guns and the dreaded Rocket Propelled Grenade, a holdover from Afghanistan’s war with the Soviet Union decades before. The first RPG hit the vehicle in front of Kevin’s, but even before he was able to leave his vehicle - not the much lauded Buffalo in this case - a second RPG turned his Light Armoured Reconnaissance Vehicle into a pressure cooker, killing all five of the soldiers inside instantly with the overpressure caused by the exploding grenade. Nine had died that day, the day the letter had been sent. Nine sons that would never see another Christmas, one of whom was his own precious Kevin. You have heard the name, but do you know the story of Rosa Parks and the role she played in the Civil Rights Movement? What happened in Montgomery in 1955 was far more important than anyone imagined when the events were unfolding at the time. Rosa Louise McCauley did not begin her life dreaming of becoming the “Mother of the Civil Rights Movement”, she was born in Tuskegee, Alabama, the granddaughter of former slaves and the daughter of a carpenter and rural schoolteacher. Rosa moved to Montgomery, Alabama, and attended Alabama State College, an all-black school. It was there, in 1932, that she married Raymond Parks, who worked as a barber. It was at this time that Rosa also became active in Montgomery’s chapter of the NAACP, the National Association for the Advancement of Coloured People. Her work with the NAACP was more than just passive membership; when she joined the organization in 1943 she worked with the state president, Edgar Daniel Nixon in mobilizing a voter registration drive in Montgomery. Rosa Parks was also elected Secretary of the Montgomery branch of the NAACP in 1943. There should be no doubt that the heart of a true activist beat within the chest of this future Civil Rights leader, even years before the most significant act of her career would take place; an act that was born out of a desire for nothing more than fairness. In the 1950s Rosa Parks began working as a tailor’s assistant in a department store, Montgomery Fair, she also worked part-time for a white liberal couple who encouraged Parks in her Civil Rights work. Six months before the arrest that would change the history of the Civil Rights movement Rosa received a scholarship to attend a workshop on school integration held at the Highlander folk School in Monteagle, Tennessee. The workshop was aimed at community leaders, and Rosa Parks spent several weeks there. In the segregated South public transportation allowed for anyone to use the service, but it was anything but “public” in the sense that if you were a “coloured” person you had to surrender your seat to a white person, and move to the back of the bus. African Americans were required to pay to ride the bus at the front of the bus and then re-board through the back door, they were not even good enough to take a seat through the front of the bus: that is how they were perceived at the time. The first ten seats on the buses in Montgomery were permanently reserved for the white passengers, and when the bus become crowded the drivers would instruct any black passengers to make room for white passengers. On December 1, 1955, Rosa Parks refused to move. The ramifications of this action shook Montgomery to its core, changed America, and began an action that was watched by the world. It also launched the career of another Civil Rights activist, someone who would galvanise the movement, and transform it in ways no one could have foreseen before Rosa Parks’s actions that day. After the arrest of Rosa Parks she was released on a $100 bond that was posted by her employers, the Durrs, and the president of the NAACP, Edgar Nixon. 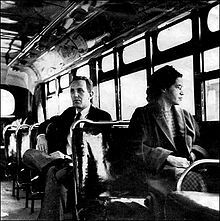 Rosa decided to allow the NAACP to take on the case and another organisation, the Women’s Political Council, which was led by JoAnn Robinson, came up with the idea of having a one day bus boycott coinciding with the date of Park’s trial. The WPC printed and distributed more than 52,000 fliers spreading the word about the boycott, on December 5, the day Rosa Parks would stand trial. 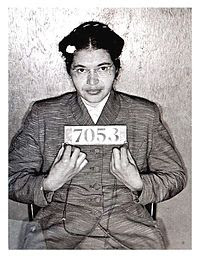 On that day the buses went through Montgomery almost empty and Rosa Parks was convicted by the local court and fined $14. With the assistance of her lawyer, Ed Gray, she immediately filed an appeal to the circuit court. While her appeal languished in red-tape, the U.S. District court was dealing with another case having to do with racial segregation and public buses, ruling that it was unconstitutional. That case, Browder v. Gayle, was ruled upon on June 4, 1956, by a three-judge panel that included Judge Frank M. Johnson, Jr. The decision was upheld by the United States Supreme Court in November 1956. Rosa Parks never paid her fine. On the day of the boycott, December 5, 1955, there was a new minister in the town of Montgomery named Reverend Martin Luther King Jr. He became the president of the boycott committee, urging the residents of Montgomery to stay off the buses, fighting for justice by opposing those who denied them the same. The boycott ultimately lasted 381 days and propelled King into the spotlight of national prominence as a Civil Rights leader whose voice could not be ignored. The Montgomery bus Boycott remains as one of the seminal Civil Rights actions, a marking post in the history of the movement, and it all began with the actions of one woman named Rosa. There are many times where the term “wrong side of history” is used, but it is still a valid term, it is not an overused term, particularly when it comes to important events in history. A recent event that qualifies to have the term applied to it is the vote that took place in the United Nations to grant the embattled Palestinian Authority the status of “non-member observer state” in the United Nations. This would not give them the full status of a “member nation” like the United States, or Canada, but it would allow them to join other UN agencies, and more importantly, eventually bring cases to the International Criminal Court. The vote in the United Nations took place sixty-five years after the historic partition of the British ruled territory that became Israel, but which was also supposed to become an Arab controlled nation; the nation of Palestine. The treaty has been broken from the first, and it is time for Palestine to be born. One hundred and thirty-eight nations decided that giving Palestine the stylus of a “non-member observer state” was the least that they could do at this time, while perhaps being a token, it was also the right thing; they recognised that the Palestinian people have been living under an apartheid rule, living under the threat of Israeli aggression at the slightest provocation. Guns answering rocks, bombs being dropped on unarmed civilians, and refugees languishing in camps for generations hardly seems like the fair observation of a treaty. Instead of having the ambassador to the United Nations from Canada speak, the Foreign Minister himself, John Baird, decided to take it upon himself to travel to New York and personally address the UN on this matter. Rather than supporting the idea that Palestine deserved to have a greater voice in the international community, Canada’s Foreign Minister chose to be a vocal opponent to the vote. Canada's Foreign Minister chose to stand on the wrong side of history. If by “unrealistic expectations” Mr Baird is referring to the idea that the Palestinians might call on the international criminal court at some point, perhaps he is correct; the ICC tends to be slow to judgement, but that is no reason to deny the Palestinians admission to the United Nations, even if it is not a full member status. The fact that Canada, particularly under the leadership of Conservative Prime Minister Stephen Harper, has reiterated its staunch support of Israel and its policies regarding the Palestinians does not mean that the government must deny the Palestinian people representation in the United Nations. In fact, equality for the Palestinians would benefit both them and the Israelis. People who are equal, people who have the dignity of knowing that neither is being discriminated against, are less likely to take up irrational, violent acts, in order to make the point that could better be made politically. How many violent acts have the Irish Republican Army committed since the issues in Ireland were dealt with politically? If you ignore the problems they do not go away on their own; they will not go away unless they are dealt with one way or the other. Some people believe that they can be dealt with through violence, something many people abhor, but it is used nonetheless. If Palestine were recognised as a state, and the rights of the people were recognised and respected, is it not conceivable that many of the problems being experienced in that part of the world would no longer be an issue? What are the causes of the problems today? People building houses, settlements, on land that is supposed to belong to the Palestinians; unlawful arrests and attainments; blockades of medicine; people being prevented to go to work because they cannot cross checkpoints; and other things that degrade and humiliate the population living within the Palestinian Authority. Human dignity is being denied these people, and nine nations voted against giving them “non-member observer state” status in the United Nations. Those nine nations are on the wrong side of history. Canada, the United States, Israel, Panama, Palau, the Marshal Islands, Nauru, the Czech Republic, and Micronesia: these nine nations are not only on the wrong side of history, they are cowardly, insensitive, and ignorant of the historic importance of this vote. Forty-one nations decided not to vote for, or against the proposal to upgrade the Palestinian status. The motive for the abstention is curious, but neither here nor there: these nations chose to ignore the opportunity to grant another nation more rights. For some of the nations this might not seem like a difficult choice, especially when you consider a nation like Romania, or Albania, both of which have histories where suppressing their citizens is not uncommon. However, the United Kingdom also abstained, as did the Netherlands, which is quite confounding when you consider that both nations received tremendous damage during the Second World War, and are intimately familiar with the suffering associated with persecution. One would have thought that this knowledge would have made them more sensitive, more empathetic to the cause of the Palestinians. “We did not come here seeking to delegitimatize a state established years ago, and that is Israel; rather we came to affirm the legitimacy of the state that must now achieve its independence, and that is Palestine. We did not come here to add further complications to the peace process, which Israel’s policies have thrown into the intensive care unit; rather we came to launch a final serious attempt to achieve peace. Our endeavour is not aimed at terminating what remains of the negotiations process, which has lost its objective and credibility, but rather aimed at trying to breathe new life into the negotiations and at setting a solid foundation for it based on the terms of reference of the relevant international resolutions in order for the negotiations to succeed. One must ask, what does the Prime Minister mean by “acting accordingly”? After all, this was an act of peace, not an act of aggression; no one was killed, no missiles were launched, and no bombs were exploded. The United Nations is a diplomatic body, it is where peace is negotiated, it is where people go to negotiate treaties, it is where people go to have “peace talks” with their neighbours, and other nations. For the Prime Minister of Israel to assert that seeking “non-member observer state status” is some sort of precondition to the way the Palestinians will be addressing Israel in future negotiations is, in a word, delusional. One might want to remind Mr Netanyahu that even should the Palestinians become signatories of the Rome Statute, and therefore the International Criminal Court, Israel is not a signatory of the statute and does not fall under the ICC’s jurisdiction. Perhaps Prime Minister Netanyahu is feeling a pang of conscience knowing that charges could well be brought against Israel in the ICC, but unless Israel decides to sign the Rome Statute, there is nothing to fear, just as the Goldstone Report had no binding powers against Israel when it indicated that war crimes had been committed against the Palestinian people during Operation Cast Lead in 2009. Advancing the rights of Palestinians has nothing to do with religion, nor does it have anything to do with whether or not you support Israel as a nation. Israel will continue to exist, just as Palestine has a right to exist as well. This vote by 138 nations is an acknowledgement that a majority of the members of the United Nations agree that the status of Palestine should be increased. It is a recognition that the fact that there is something wrong in the “Holy Land” is obvious; the only question that remains is which side of history will you be on when the final lines are drawn. "The Podcast Page of the CrazyComposer"
"how much suffering there is ..."
A different slant on the news. The American Fibromyalgia Syndrome Association. Medical links are provided only as resources and should not be used for the self-diagnosis of any illness, especially a mental illness. If you are feeling depressed or feel compelled to harm yourself or others in any way, please go to the nearest emergency room of your local hospital or call the police immediately. There are people out there who can help you, if you let them; please, don't lose hope, and don't give up. Copyright © 2012 by Peter Amsel (aka "CrazyComposer"). Creative Commons Exceptions for Fair Use.. Awesome Inc. theme. Powered by Blogger.